It's not exactly a secret that trains in the north of England have had a few problems of late. 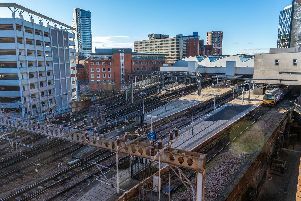 Between strikes, late running and crammed carriages, journeys in Yorkshire and the north have been subject to one or two issues. So, over the course of my time at the Yorkshire Evening Post I decided to keep notes of my train journeys, in terms of whether they actually arrived and left on time, to put the line I took to the test in the real world. Every morning I travelled from Harrogate to Leeds, and every evening made the return journey. 7th August 2018 - 9:09am - five minutes late - It was the first day of my work experience at the Yorkshire Evening Post and as you could imagine I was nervous and stressed for obvious reasons. You see I had planned well in advance how I would travel in Leeds from Harrogate and decided the best train times to go for. My best option in the morning was to get a train that left a 9:09am and arrive at 9:47am as the earlier train would get me into Leeds an hour before I was due to start. I already mentioned that I was stressed about several things, but one of the things that I didn’t need was for my train to be late by around five minutes, luckily where the train station is located meant that I didn’t have far to walk to the YEP building, it was only ten minutes away. Unfortunately my train didn’t get into Leeds until 9:53am which meant that I was going to be late on my first day. What a great first impression. 8th August 2018 - 18:29pm- six minutes late - In terms of getting home the typical train I would get was at 6:29pm and while I don’t need to worry as much about getting home late as, well, I’m not expected at home for a certain time, but still it’s nice just to get home. 20th August 2018- 9:09am - five minutes late - This was a bad day for how delayed the train times were. In the morning the train left five minutes late like it did on the first day of work experience, but then when it looked like we going to arrive only a few minutes late the train stopped outside of the station for a while. We finally got in at 9:55, over 10 minutes late. 20th August 2018 - 18:29pm - six minutes late - The train was also six minutes late in the evening for no apparent reason, it arrive about a minute or two late but we once again sat not moving. 22nd August 2018 -- 18:29pm - on time. For a third of my train journeys, the trains were either a couple of minutes late or were delayed for a while. The other two thirds ran on time on this line. None of these trains were cancelled, and the latest departure was six minutes, the latest arrival 10 minutes. Under compensation rules, none of these trains would be late enough to warrant a claim for compensation, which must be at least 15 or 30 minutes depending on the operator. How to claim for compensation You will need to claim from the train company which was running the delayed service, even if you booked the ticket via a different website, within 28 days of the delay. You can do this by visiting the train company’s website, and most have online forms you can fill out. You’ll probably need to upload a picture of your ticket, so be sure to keep it. Alternatively, you can write them a letter. You will need to include details of your journey, and send your original tickets. You should get a refund within a month. Several train companies will offer vouchers to use on future train journeys, but you don’t have to accept them – if you want a cash refund, insist on it.